The perfect companion to the New York Times bestselling I Am Number Four series! 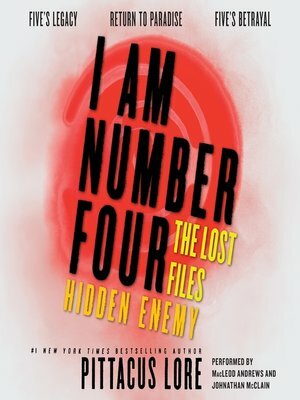 I Am Number Four: The Lost Files: Hidden Enemy is the third collection of action-packed novellas from Pittacus Lore. Initially published separately as digital originals, these three stories are now together in one volume. Lost Files: #7: Five's Legacy tells the story of Five's early years on Earth when he was just a young teen on the run, discovering his abilities and making the wrong kind of friends. Lost Files: #8: Return to Paradise picks up in the aftermath of the Mog attack on Ohio and follows Mark James as he struggles between returning to a normal life and helping John Smith and the others. Lost Files: #9: Five's Betrayal is the exhilarating continuation of Five's story, in which he joins the Mogadorian ranks and must demonstrate his allegiance to them by helping to destroy the other Lorien survivors. You know the truth about the Mogadorians' invasion of Earth and the Garde who will do anything to defeat them—yet there is still so much to learn. The stories in Hidden Enemy will help you get the answers you seek, but they will not help you stop the coming war. Only the Garde can save our planet. The I Am Number Four series is perfect for fans of science fiction adventures like the Fifth Wave series by Rick Yancey and the Beautiful Minds series by Alexandra Bracken. Pittacus Lore is Lorien's ruling Elder. He has been on Earth preparing for the war that will decide Earth's fate. His whereabouts are unknown.